Light filled penthouse with unique character! Brewery District Condominiums - New Conversion. Time to call 8 Marbury Terrace home! High ceilings and spacious two bedroom/living room. Refinished hardwood floors and french paned glass doors separate the bedroom/living room and dining/living room (you decide). Spacious southern facing eat-in kitchen with bonus wine refrigerator. Enjoy the convenience of in unit laundry hook-up. Paved driveway with one parking space. Easy stroll to Stony Brook Station, Kelly Ice Skating Rink, South West Corridor park, community gardens. & bike paths. Explore the vibrant Brewery District with Chilacates, Bella Luna/Milky Way, Mikes Gym, Ula Cafe, Egleston Square Farmers Market, & Sam Adams Brewery. 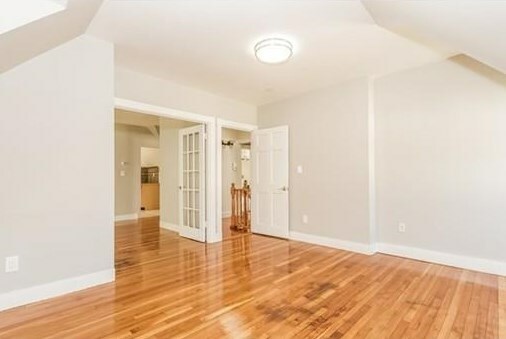 8 Marbury Terrace #3, Boston, MA 02130 (MLS# 71972776) is a Condo property that was sold at $430,000 on May 23, 2016. Want to learn more about 8 Marbury Terrace #3? Do you have questions about finding other Condo real estate for sale in Jamaica Plain? You can browse all Jamaica Plain real estate or contact a Coldwell Banker agent to request more information. The data relating to real estate for sale on this site comes from the Broker Reciprocity (BR) of the Cape Cod & Islands Multiple Listing Service, Inc. Summary or thumbnail real estate listings held by brokerage firms other than Coldwell Banker Residential Brokerage are marked with the BR Logo and detailed information about them includes the name of the listing broker. Neither the listing broker nor Coldwell Banker Residential Brokerage shall be responsible for any typographical errors, misinformation, or misprints and shall be held totally harmless. This site was last updated Apr 22 2019 5:52PM. All properties are subject to prior sale, changes, or withdrawal. The property listing data and information (in part) set forth herein were provided to MLS Property Information Network, Inc. from third party sources, including sellers, lessors and public records, and were compiled by MLS Property Information Network, Inc. The property listing data and information are for the personal, non commercial use of consumers having a good faith interest in purchasing or leasing listed properties of the type displayed to them and may not be used for any purpose other than to identify prospective properties which such consumers may have a good faith interest in purchasing or leasing. MLS Property Information Network, Inc. and its subscribers disclaim any and all representations and warranties as to the accuracy of the property listing data and information set forth herein.